“Mobility, cloud and the internet are transforming industries." Cloud computing and mobility has “significantly changed” the information and communication technologies (ICT) industry. According to Frost & Sullivan findings across the region, cloud computing, big data, mobility and low cost sensors are driving the IoT, and the IoT is forcing disruption, transformation and innovation across connectivity and convergence of people and industries. The analyst firms defines IoT spending as revenue from hardware, software and professional services that are directly attributable to the IoT solutions and services. As a result, by 2017, the IoT market will be one of the fastest growing segments in the Asia Pacific technology industry with the total APAC spending on IoT spending forecasted to be US$59 billion by 2020. Across the region specifically, Japan, Singapore, China, Australia and South Korea have been early IoT adopters, but India, Malaysia, Thailand and Indonesia are expected to be amongst the fastest growing markets to 2017. Audrey William, Head of Research, ICT Practice, Australia and New Zealand, Frost & Sullivan believes that cloud is allowing access to content on any device in any location, while big data enables value to be extracted out of exponential increase in data. “Mobility, cloud and the internet are transforming industries, spanning across automotive, healthcare, manufacturing and consumer sectors,” William adds. For William, companies such as Airbnb, Uber and Netflix employ and maintain a flexible and nimble business and have increasingly put more power into the hands of the consumer. However, the level of digitisation in the manufacturing industry has not kept up with the pace of other industries such as telecoms. William says that various initiatives by organisations such as the Smart Manufacturing Leadership Coalition (SMLC), aim to bring together stakeholders to develop the measures needed to facilitate the broad adoption of manufacturing intelligence. “Cloud and mobility are driving the emergence of apps which can be used on any IP enabled device,” William adds. “IPv6 is enabling proliferation of IT-enabled sensors/devices across industry-specific activities. 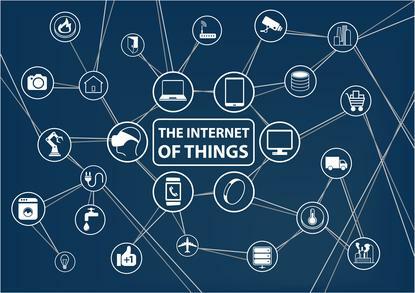 Of course, William adds that adoption of the IoT is not without its challenges as there are several hurdles that could prevent it from achieving rapid growth. “Security and information privacy are some of the largest hurdles to the adoption of IoT,” she adds. The global wearable technology market was estimated at US$8.58 billion in 2014 and is expected to reach US$38 billion in 2017. North America and Europe are more mature markets, while the Asia Pacific region accounts for just over 4 per cent of the global wearables market. William says that the market is currently dominated by standalone devices such as activity trackers and wearable recordings. For William, the future of wearable technology will be characterised by its functionality, design and non-intrusiveness. Wearable devices are moving away from the face and wrists, and onto glasses, clothes and jewellery. Smart glasses has many promising applications in industries ranging from healthcare to manufacturing, and is expected to grow by 10 times in the next 5 years. “Glasses and watches will adopt a premium positioning, while trackers and wearable recording will largely compete on price,” William adds. “Wearables such as smart watches and glasses with a wider range of functionality will eat into sales of standalone devices such as activity trackers and wearable recording. William also noted that many non-ICT industries are starting to explore wearable technologies. “The healthcare industry is exploring surgery with glass technologies, patient monitoring and use of big data,” she adds. “The education sector is enhancing the learning experience through devices such as the Oculus. “The engineering sector is using safety, maintenance, remote assistance and heads up display. Also, William says that wearables are being redesigned for infotainment and information delivery revolution will change the way content is created. “Accessories are being embedded with additional capabilities from tracking of physical activities to video recording activities,” she concludes.